UNITED NATIONS, February 22, twice updated -- As Libya moved to deny visas to citizens of 25 European countries due what it calls their ban on travel by 180 prominent Libyans, at the UN Inner City Press has been told that the Libyan President of the General Assembly, Ali Treki, is on the travel ban list. One member of Treki's office at the UN said he is on the list, and that it why in his trans Atlantic trip he visited only the UK, which is not a part of the EU's Schengen passport agreement. Another member claimed that, despite the list, Switzerland had provided assurance that Treki could visit Geneva, since he is president of the UN General Assembly. Swiss diplomats at the UN have been untransparent. The mission's spokesman forwarded Inner City Press' request for confirmation or denial to two officials in Geneva, saying he is on the way to Burundi. One of these officials has an "out of office" auto-responder on; the other has not replied. Nor has Ambassador Peter Maurer, chairman of the GA's budget committee under Treki's presidency. 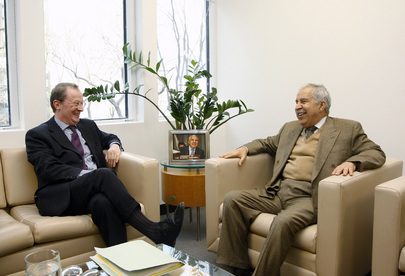 Ali Treki with Belgian president of Geneva-based HRC: could Treki travel there? All of Inner City Press' inquiries said the questions were on deadline, and Inner City Press has waited more than 48 hours. Dear Mr Lee - Switzerland is pursueing a restrictive visa-policy towards Libya. We cannot give you any further information on this subject. The dispute began when Switzerland arrest Libyan leader Gaddafi's son, for abusing his employees. Libya retaliated by locked up to Swiss businessmen. Switzerland prepared, Libya says, a list of Libyans to be barred from travel from all 25 members of the Schengen agreement. Italy has asked Switzerland to reconsider. Can a UN member state like Switzerland put the president of the UN general assembly on a travel ban list? Watch this site. Spokesperson Nkolo: Either way, I cannot. I cannot comment simply because I haven’t seen that list, if there is a list. I just haven’t seen it. Inner City Press: [inaudible] and made inquiries, and so, that’s why I’m asking you just to find out. I mean, I think an inquiry has been made by your office to the Swiss about travelling to Geneva. And so, it seems to me like, maybe he can say something about whether… do you believe he shouldn’t be on the list, and if so, why not? Spokesperson: I think that we can comment when it is about the President of the General Assembly. It happens to be that President Treki, for this year, for the sixty-fourth session, is the President of the General Assembly. But, when it is a matter between a Member State, in this case, Switzerland, and another Member State, in this case, Libya, I think it should be safer to check, to have an authoritative response from either or both Permanent Missions of both these countries. Inner City Press: I’m only asking because it’s about him personally, and it’s hard to distinguish if it’s about Ali Treki the person, it’s hard to distinguish whether it is in his capacity as a former Libyan diplomat or as President of the GA. So, I’m assuming, do you only speak for him in one… I mean, I’m not asking you to opine about Libya. It’s more, is he on the Swiss list and is there a way to find that out? Spokesperson: Since I haven’t seen the list, it is very difficult to make that assessment and to know the basis upon which I may be commenting. I haven’t seen the list. I don’t know where this list is, if there is a list. So, if we see a list, and if we have that confirmation either way, then we’ll be able to comment. Inner City Press: In fact that’s why I [inaudible]. Do you believe that…? I mean this will be… Can he travel to France of Germany today? Is that your understanding? Spokesperson: I do not want to answer hypothetical questions. Question: I’d like… Just to follow up. Question: Did you, obviously, like Matthew said, send an inquiry to the Swiss Mission asking them whether Mr. Treki can travel? Is this true? Did you send an inquiry? Spokesperson: I cannot confirm any official démarche from our Office to make that kind of inquiry. Spokesperson: I do not have any official démarche that is on the record from our Office making such an inquiry. Question: Since you also that you haven’t seen the list and you’re saying you would not like to comment and you are also saying that you would not like to answer on the question whether this requirement means that he is on the list or not. So, I am asking you now, do you know whether Mr. Treki, the President of the General Assembly, is on the list or can or not travel to those countries? Correspondent: That’s what I understood. Spokesperson: Very good. So, I am going to make myself clearer, if I may. What I am saying is that I haven’t seen the list. I don’t think we have that list in the Office, because I see everything that we have in the Office. I haven’t seen the list. I can, therefore, not make a speculative comment on a list that I haven’t seen, because the list, if it is out there, will enlighten us on the basis of which a name is on the list or not. So, not having seen the list, it will be for me very speculative to comment on a list I haven’t seen and that I cannot confirm one way or another. Question: But you do not have knowledge of whether or not he is with such a ban, or without a ban? Spokesperson: I absolutely don’t have that knowledge, whether he is on the list or not. I have been trying to find out myself, but it is not my own authority to find out. And I think we haven’t seen the list, I haven’t seen it. That’s why we cannot comment further. And I do not think that this question, for the time being, somehow infringes the travel of President Treki as the President of the General Assembly. UNITED NATIONS, February 16 -- The Committee to Protect Journalists on February 16 called on UN Secretary General Ban Ki-moon to be more forceful about the importance of press freedom. Inner City Press asked CPJ's Asia expert Bob Dietz about what Mr. Ban and CPJ have done as the Sri Lankan government of Mahinda Rajapaksa has closed down opposition newspapers, reporters have been killed and websites blocked. Video here, from Minute 40:08. Dietz said that "no one knows how to handle the direction in which the [Sri Lankan] government is going, which is not friendly to the media." He said it might join the "pariah states" of Myanmar, "Burma, North Korea and Zimbabwe," but for feisty journalists who put themselves at risk. But as to what CPJ does, Dietz said "right now we are hanging back with a lot of people," trying to figure out whether to "come down hard or engage in quiet advocacy." Afterwards, Inner City Press asked Dietz for more specifics about this "quiet" approach, which the UN seems to share, in the most benign interpretation of Ban's visit in May 2009 after what even the UN called the "bloodbath on the beach" and since. Even the UN's Children and Armed Conflict mandate, which belatedly sent Patrick Cammaert to Sri Lanka in December, never had him brief the Press afterwards. Radhika Coomaraswamy, when Inner City Press asked her about this silence last week, said that Cammaert went to Europe to get married after his trip, then it was "too late" to brief the press about his visit. 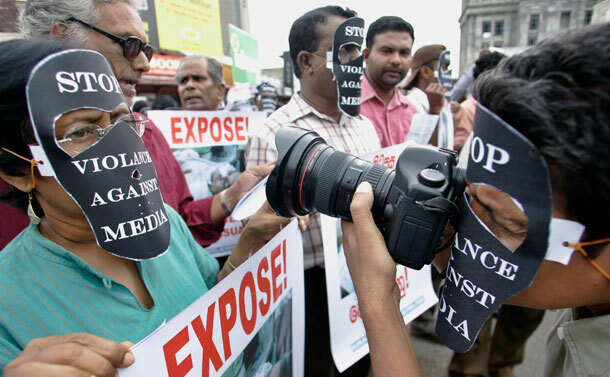 Dietz said that the opposition press in Sri Lanka asks that particular journalists' cases "not be publicized," as it would only make things worse. "Just get us out of here," Dietz said such journalists ask, adding the CPJ helps with plane tickets. Another correspondent remarked afterwards is that "quiet advocacy is what diplomats do, not journalists or their organizations." Inner City Press asked CPJ's deputy director Robert Mahoney about the UN's own envoy to Somalia Ahmedou Ould Abdallah having called on a "moratorium" on Somali journalists reporting on the killing of civilians by the African Union peacekeepers of AMISOM. Mahoney said it is up to journalists to make their own editorial decisions. Ironically, Ban Ki-moon's spokesman Martin Nesirky has, at least in his first month on the job, said such things as "that's not a story." Also on the podium was Newsweek journalist and filmmaker Maziar Bahari, about whom CNN's Fareed Zakaria devoted the foreword to CPJ's study. As Bahari spoke, a representative from Iran's Mission to the UN sat in the UN press hall's front row, taking notes. The Iranian mission has invited UN correspondents -- including this one -- to a celebration of Iran's national day on February 18. Inner City Press told Bahari about the event, encouraging him to come and cover it. Watch this space. Footnote: three hours after the CPJ press conference on its report, "Attacks on the Press in 2009," which names North Korea as the world's most censored country, Inner City Press asked Mr. Ban's senior advisor Kim Won-soo and political advisor Lynn Pascoe if they had even raised press freedom during their recent trip to Pyongyang. Video here. No, Mr. Pascoe said. Inner City Press asked Mr. Kim to respond for Mr. Ban on CPJ's wider call to be more forceful on press freedom. While he answered about UNDP in North Korea, he did not answer on press freedom. Inner City Press has at UN noon briefings asked for Mr. Kim to come and answer questions more often. We'll see.